Space Pulp - ZaH YaH! Comic 391 - ZaH YaH! Well, we'll be on our way once Ayata stops giving the rear-admiral the stink-eye. 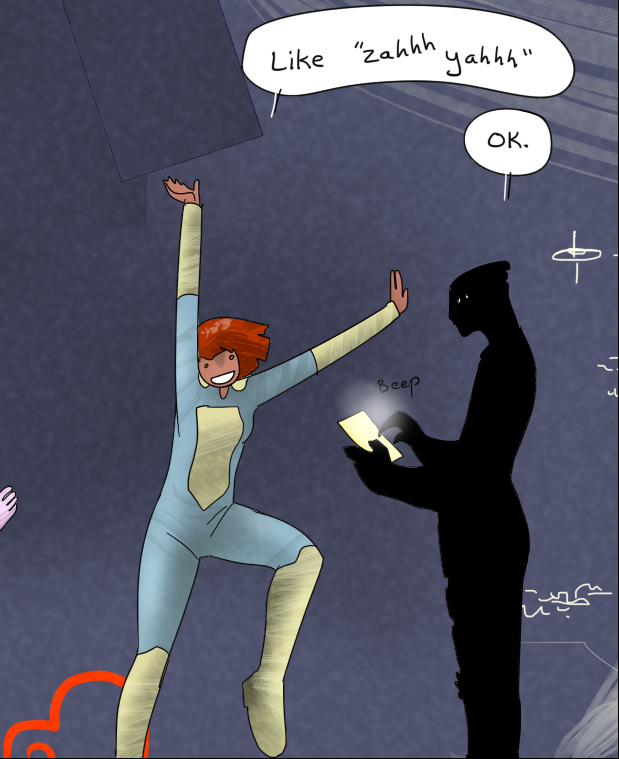 I think 'Like "zaaaaah yahhhhh"' and all happyface is my favorite panel of Iri ever. Nothin' better than dodging mines with the dance of not running into mines. Yes! Can we have a HiRes of that panel, please?!? It's awesome: Iri is dancing and babbling around like a Shamaness on shrooms and Jagi stands deadpan next to her and takes notes like that's the most normal thing in the Universe. You guys didn't learn phoneme dance variants? She said, "The minefield is a labyrinthine cloud of death from which only your steadfast courage can save you; also just go left here." Iri: Jagi, the possibility of successfully navigating an minefield is approximately 3,720 to 1. Jagi: Never tell me the odds. Seriously though, that dance panel is adorable!